And then take action to stop it. Scientific evidence of man-made climate change hasn’t been enough to convince the world to take action and reduce environmental destruction. Perhaps, then, it’s up to artists to make an emotional appeal, rather than a logical one. 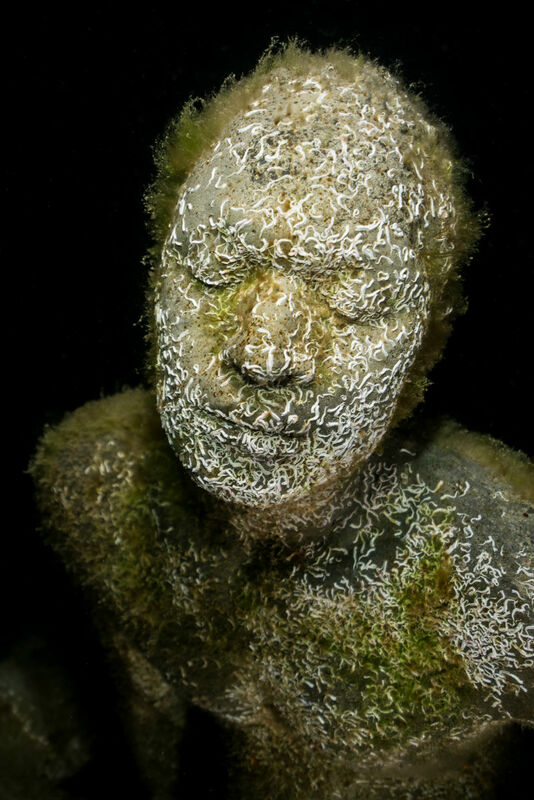 Jason deCaires Taylor, a world-renowned sculptor whose work seeks to highlight the environmental impact humans are having on the world’s oceans, has a new exhibition in Venice, Italy. 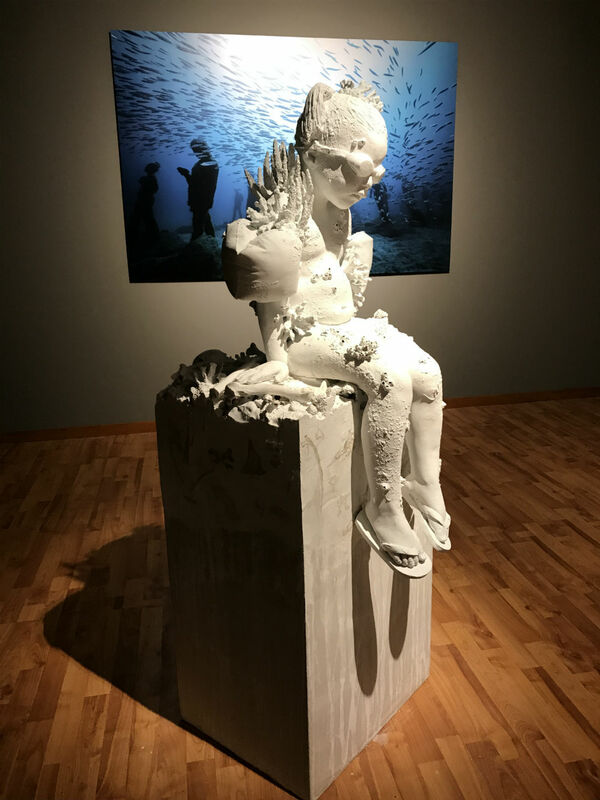 Taylor’s new collection of large-scale photographic prints and series of sculptures focus on coral bleaching, one of the most blatant visual indicators of climate change. 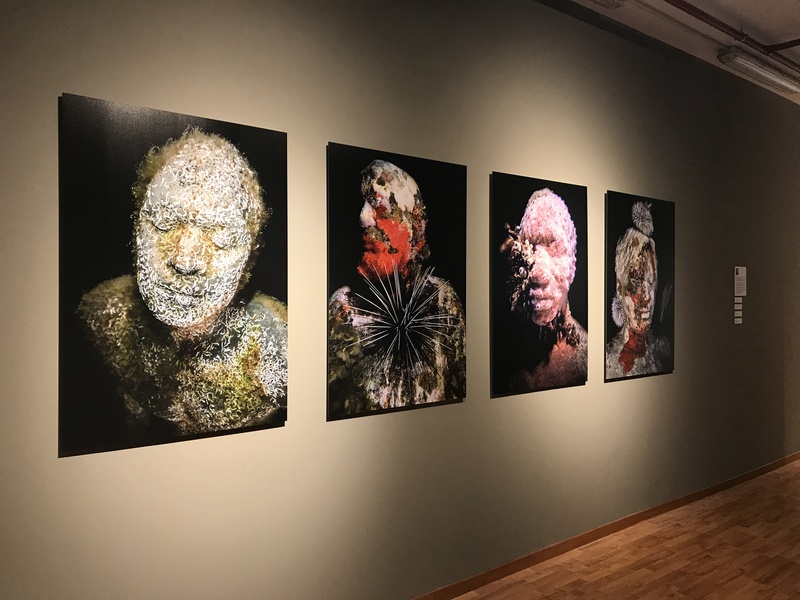 Part of the 57th Biennale di Venezia art exhibit at the Grenada National Pavilion, the exhibit opened on May 12 and will be on display until November 27. Coral bleaching occurs when water becomes too warm and the algae living on a reef gets expelled. Algae gives coral its vibrant color, provides a necessary food source, and fosters ecosystems. When it gets overheated and leaves, a reef turns white and becomes much more prone to disease, and when a reef entirely collapses after successive bleaching, it can’t regenerate. Earth’s oceans are warming at an accelerated rate which has led to a global coral bleaching event that started in 2014 and continues to this day. Coral reefs are home to some of the most diverse ecosystems in the world, are central in recycling nutrients through the marine food chain, and protect coastlines from wave damage and tropical storms. Furthermore, Australia is just one country whose economy is reliant on coral reefs – the Great Barrier Reef generates more than $1.5 billion per year for the nation’s economy from fishing and tourism. Bleaching hit 90% of the coral on the Great Barrier Reef in 2016, according to Taylor. 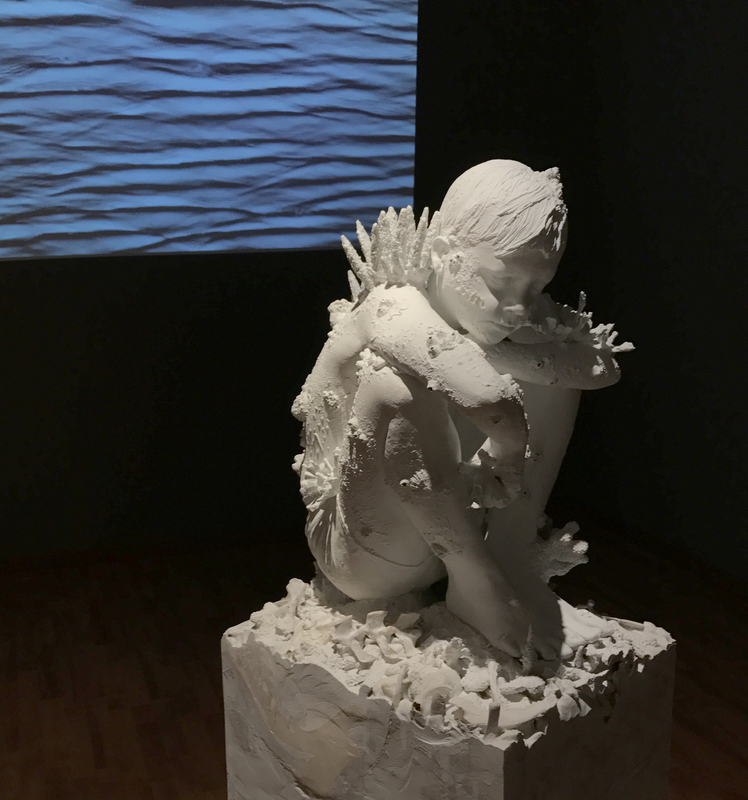 Taylor’s sculptures depict children covered in coral who have been bleached white. By personifying the marine invertebrates, the tragedy is presented on human terms and could instill a greater appreciation for the loss of life – coral bleaching is life on Earth needlessly dying at the hands of human activity – and a stronger sense of urgency to save it. Human-like figures are also Taylor’s trademark. He’s previously had underwater installations in the Bahamas, Mexico, Grenada, and the United Kingdom. 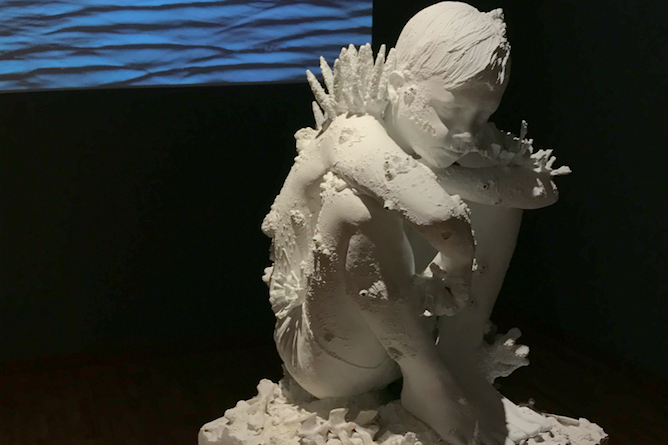 Most recently, he opened the Museo Atlantico off the coast of Spain, which features more than 300 submerged sculptures inspired by the global refugee crisis. The underwater museum also acts as an artificial reef, which saw a 200% increase in marine life shortly after it opened last February. Taylor is not alone in his eco-sculpture efforts, and has recently been at the center of some controversy. 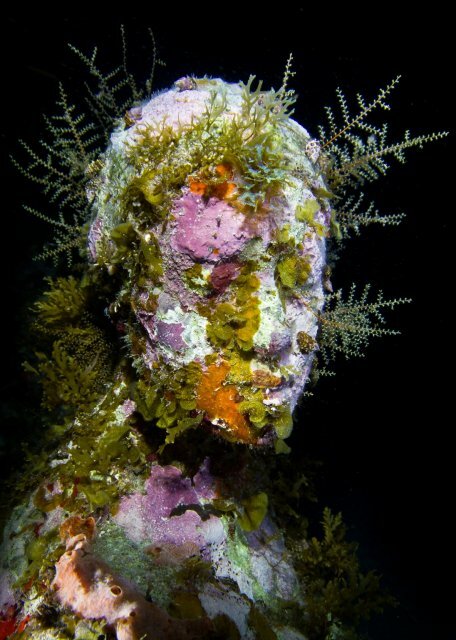 Damien Hirst, another sculptor who draws on ocean life as inspiration, has been accused of plagiarizing Taylor with his installation “Treasures From the Wreck of the Unbelievable,” also on display in Venice at the Punta della Dogana. While Taylor does acknowledge similarities between their work, his primary focus is on the unified message that both artists are trying to deliver and on inspiring people to act to save the world’s oceans from destruction. “If people really want to see ‘unbelievable treasures’ they should look below the surface of our seas at the real live wonders of the blue world – nature does not lie,” he said.